Below is a first draft of some info regarding cold weather and how it impacts your car. More information and links out to other info and videos will be added. This info is initially drafted with reference to Model 3 but in general may be applied to all models. When it gets cold, what changes with my car? Regen is limited, indicated by the dots on the display and message on the screen. This will cause more use of the traditional brakes until the battery warms up and regen returns. What is a cold-soaked battery? A cold-soaked battery refers to a battery that has been sitting in cold weather for an extended period of time and the temp of the battery itself has become very cold. Obviously overnight this happens in cold weather but can also happen during the day if parked for an extended period of time in the cold. 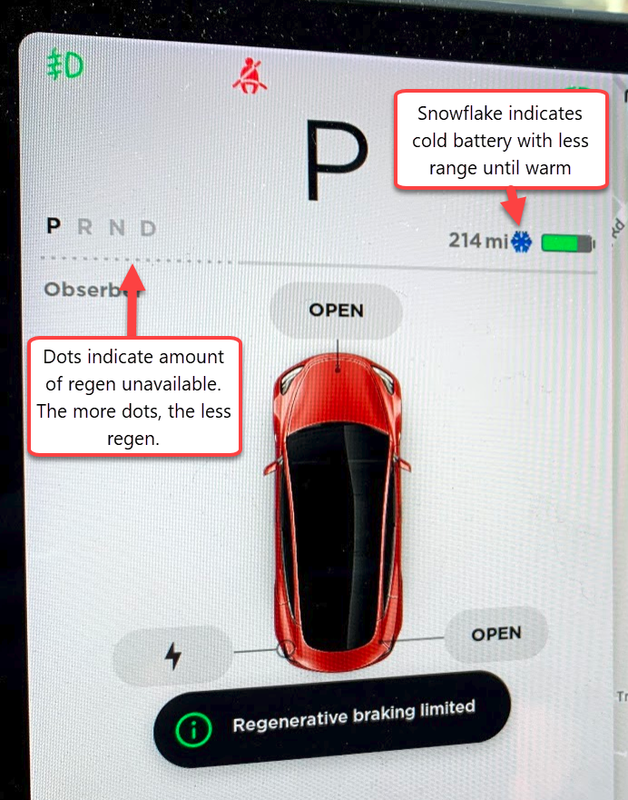 The battery indicator in the Model 3 will display a snowflake if the battery is very cold and some of the energy in the battery is essentially trapped until the battery warms up. How much range is lost in cold weather? Well that mainly depends on how cold it gets, and it also depends on your driving plans. Range reduction could be 30% in extreme conditions of around 10 degrees fahrenheit. What should I do in general when it gets cold? The best and most basic thing you can do is to check your tire pressure and adjust as needed. The recommended cold pressure is listed on a plate in the driver side door frame. This is the recommended pressure when the car has been sitting for a few hours, not right after you have been driving it. What’s the best way to travel when it’s cold? If the car has been sitting overnight in cold weather and is supercharged without warming up the pack, it will take a long time. If you need to supercharge at your destination, do so when you arrive, while the battery is still warm from use. If possible plug in at your destination. I know that sounds obvious, but pre-heating the car in the morning while it’s plugged in makes a significant difference due to the preheating of the battery. Apart from the obvious gains of a full charge overnight you get an additional boost in the morning. Will the on-board navigation take into account the cold weather? The on-board navigation may be slightly optimistic upon starting your trip in cold weather, but will adjust to the car's use of power and reflect a more accurate estimate after you have been driving for a little while. As you progress on your trip, the navigation will update recommendations should it need to, such as indicating that you will need to reduce speed or change your supercharging recommendations.